Jodi, I am receiving TTD (temporary total disability) benefits and the authorized doctor told me that he is releasing me to return back to light duty work. Should I report to work immediately? Jodi Ginsberg responds: No, you should not return to work right away. You should wait until you receive a form in the mail called the WC-240 form. The WC-240 form is completed by the insurance company and describes specifically a light duty job, the date and time that this light duty job will be available. The WC-240 protects you, the injured worker. If you show up at your job site and your employer really does not have a light duty job that corresponds to the limitations on the WC-240, your refusal to try a job outside those limitations will not damage your case. Further, if you try the light duty job for up to 14 days and cannot perform it, your TTD benefits will resume immediately. If you return to work without a WC-240, you risk the situation where the light duty job really is not light duty. If you cannot perform it and/or if your employer terminates you, your TTD will be cut off and, of course, your job is over as well. 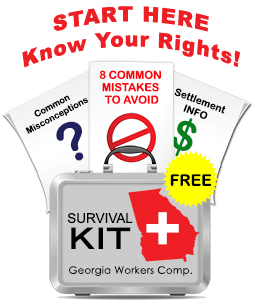 You then have to file for a hearing and wait two to three months to ask a judge to reinstate your benefits. If you return to work with the WC-240, the burden falls on the employer/insurer to try to stop your benefits. If you return without this form, the burden may fall on you to try to get your benefits restarted. This is a big distinction and can determine whether you have money coming in every week while you recover. Further, if you have money coming in you will be less likely to be pressured into a cheap settlement. Sometimes, an injured employee may be pressured to return to work immediately by his boss or even by a well meaning spouse or co-worker. Do not be manipulated in this manner. If you have been receiving benefits and your doctor tells you that he will be issuing a light duty release, wait for your WC-240. As an aside, part of my job as a claimant’s lawyer is to review the WC-240 to make sure that the light duty description is consistent with the medical records, and to object if it is not. Further, if it turns out that my client cannot perform the light duty work, I will assert my client’s right to a resumption of TTD benefits. i injured my shoulder at work back in march i reported it to my employer. they never turned it in and never sent me to a wc dr. so i went on my own and continued to ask them to file a report still nothin. so i wrote out what happened when and where and how it happened on paper and turned it in. still nothin no dr. appt. they promised to get one never did. so i went again on my own started taking pt for 7weeks still no relief had mri showed had partial tear in my left shoulder continues pt for 3 weeks more after another injection still no relief had surgery 8 weeks ago. went to my dr. said i can go back light duty and im talking light duty no over head lifting and no lifting over 3 lbs. any way my ? is they only want to give me part time work do i have to except that? by the way no i have not received any benifets as of today. they have agreed to pay but have not received anything.